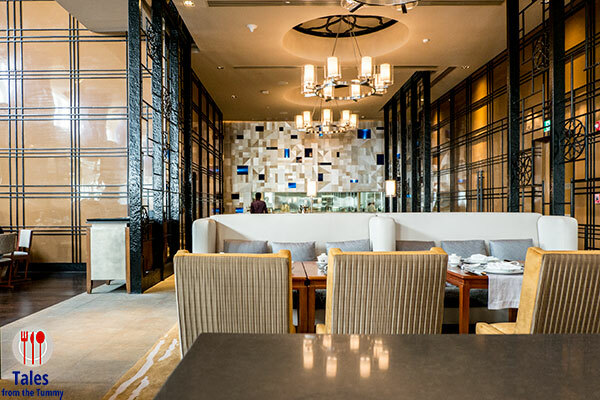 China Blue is the modern Chinese restaurant inside Conrad Manila. 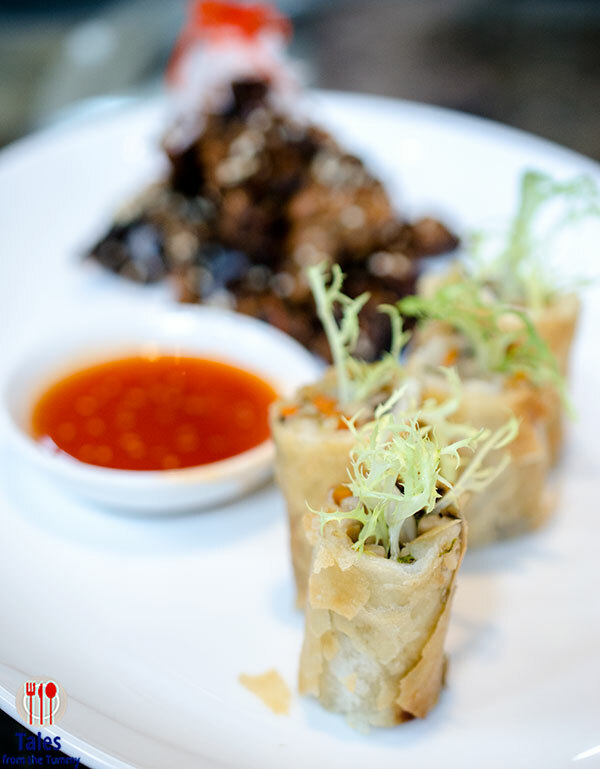 Chef Jereme Leung created a menu focused on his modern interpretations of classic Chinese cuisine. The approach shows in the food as well as the interiors. High ceilings, azure chandeliers, relaxed but sophisticated seating. 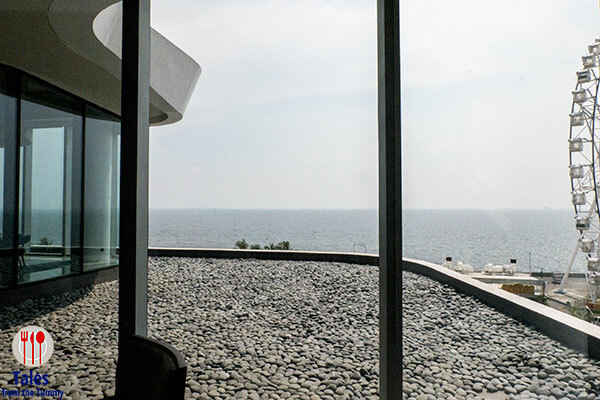 Conrad Manila boasts some of the best views of Manila Bay and China Blue is no different. Floor to ceiling windows give you a glimpse of the MOA eye and the bay in the distance. 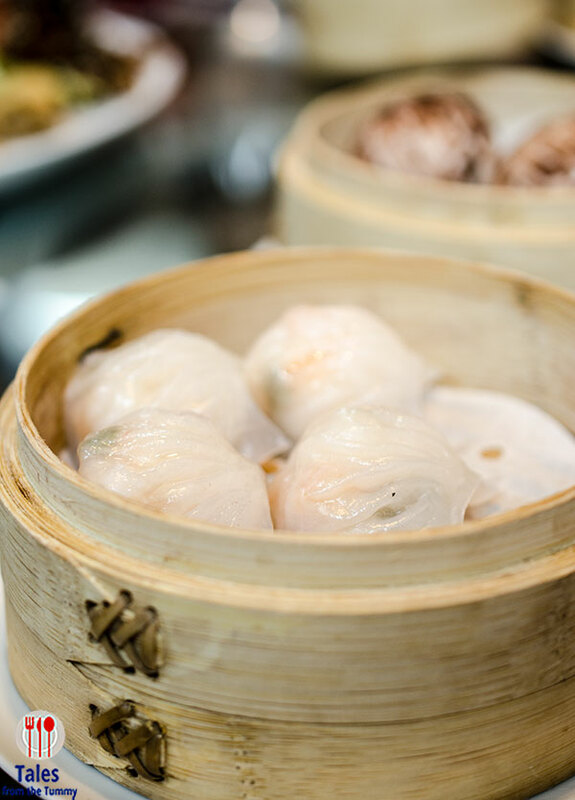 We started our lunch with some dim sum, Har Kau (P230) and Steamed Truffle Mushroom Bun (P290). The har kau are one of the best in Manila, crisp shrimp pieces encased in thin but sturdy wrapper. 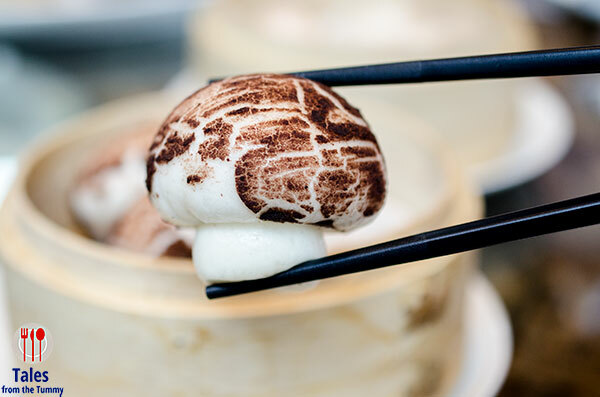 The truffle mushroom bun looks like something out of the Super Mario game and is soft and filled with minced mushrooms cooked like a faux char siu. Stir Fried Mushrooms and Mushrooms Spring Rolls. 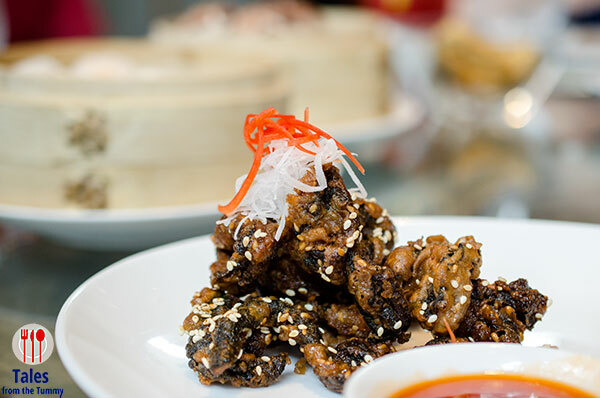 The stir fried mushrooms looks very similar to crispy eel in texture and even taste. Eating both would not have you looking for the meat dishes they were patterned after. 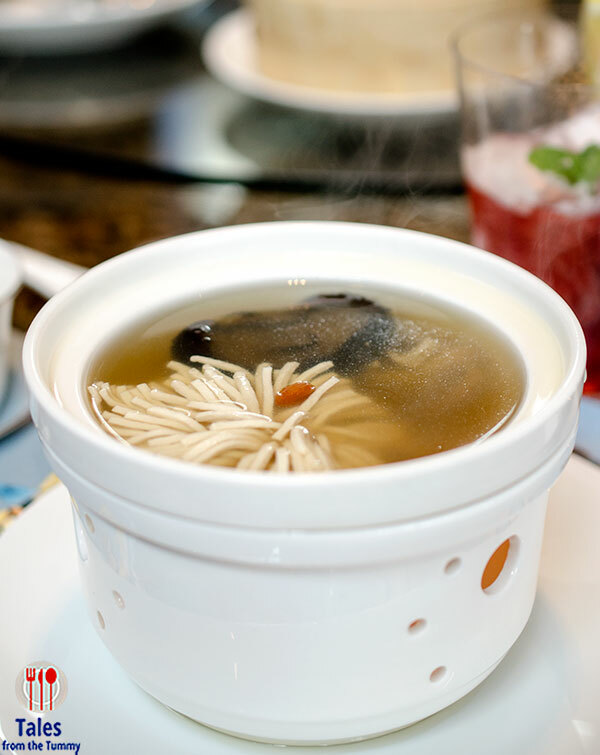 Chrysanthemum Tofu with Tibetan rock grains and dried conch Consomme (P390/ per person). 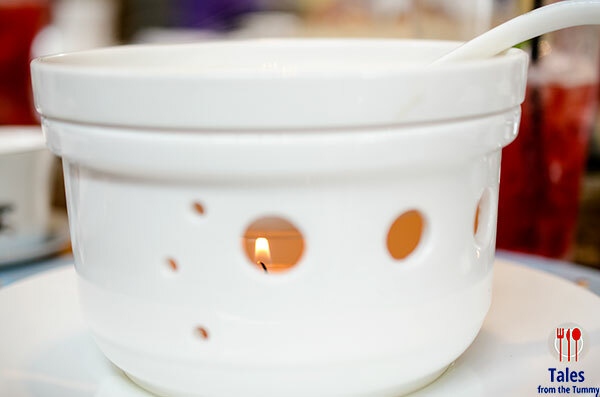 The soup comes with its own warmer to keep it at the right temperature. Light and umami filled broth that features a piece tofu that highlights superb knife skills. 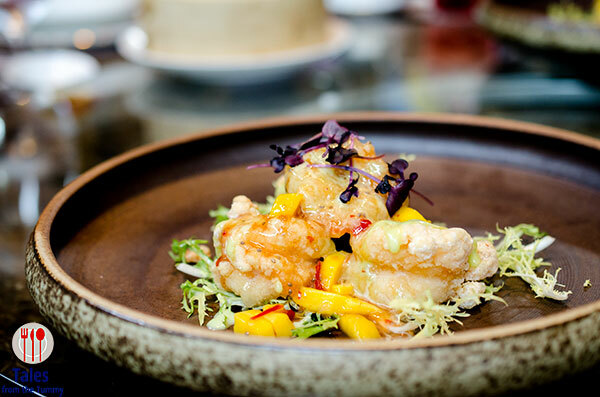 Crispy Fried Shrimp with Wasabi and Mango Salsa (P890). The mango and wasabi salsa give the shrimps a contrasting sweet and spicy taste. Crispy Pumpkin with Salted Duck Eggs (P390). Whimsically presented like the pieces of pumpkin flowed from a cup. Crispy on the outside with generous amounts of salted duck eggs complement the creamy and sweet pumpkin. Another dish that should convince non vegetable eaters to try them out. 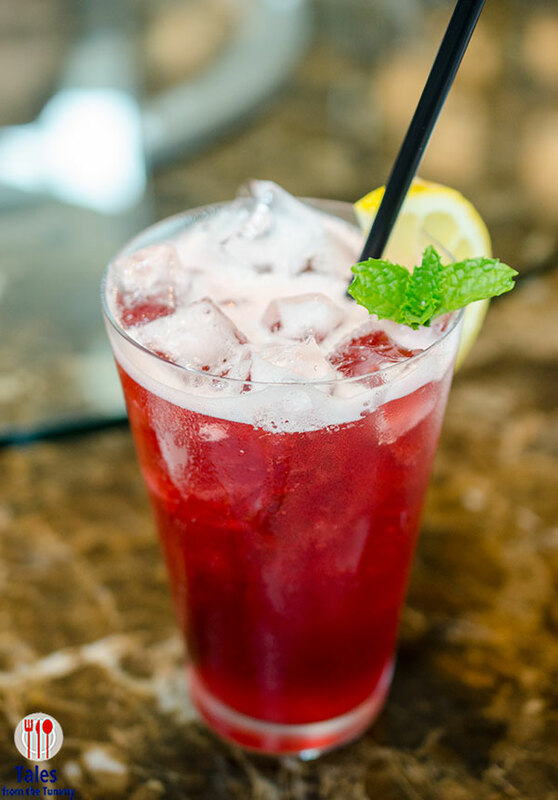 Have some of their Hibiscus Iced Tea to go with your meal. It’s refreshing and will help wash down the rich flavors of the meal. Rose Apple and Pork with Sweet, Sour and Spicy Sauce (P550). China Blue serves this classic dish two ways, the first is the usual sweet and the second is with a little spice. 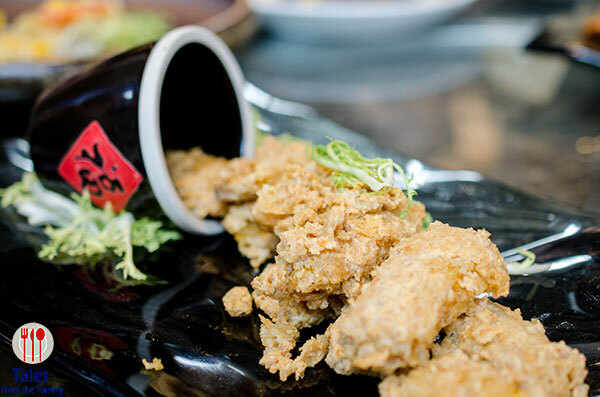 This dish is done right, thinly sliced meat, fried and then coated in sauce. The meat pieces stay crispy and is coated with the just the right amount of sauce. The spicy version gives a new twist and is a welcome addition to people who like a bit of zing. 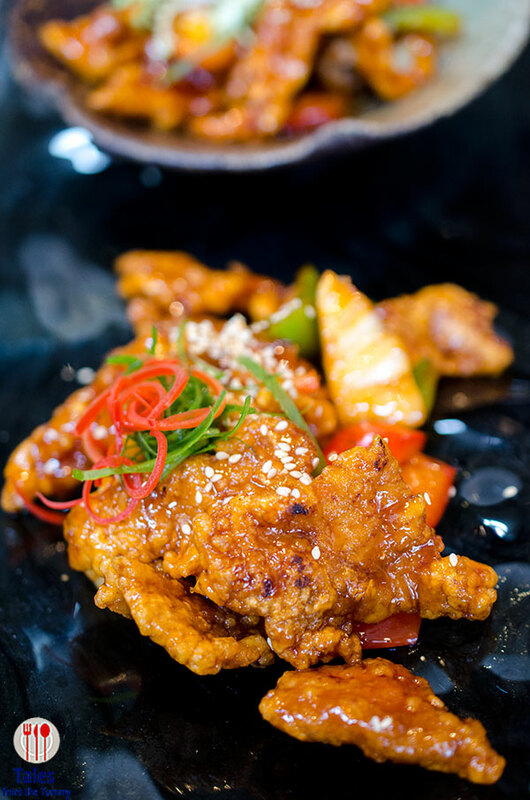 Wok Fried Tenderloin Cubes with Hunan Peppers (P950). You might think the star of this dish are the tender beef cubes and you’d be wrong. 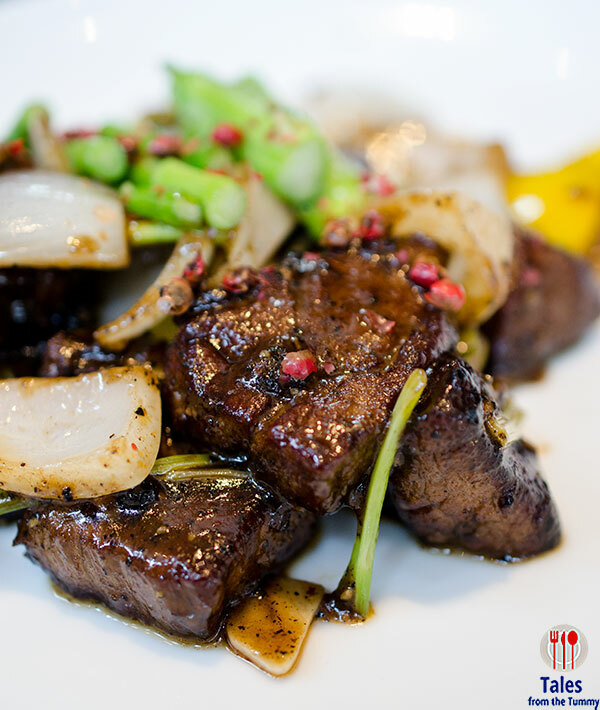 The red Hunan peppercorns are very aromatic and coats the beef in a distinctive peppery flavor. 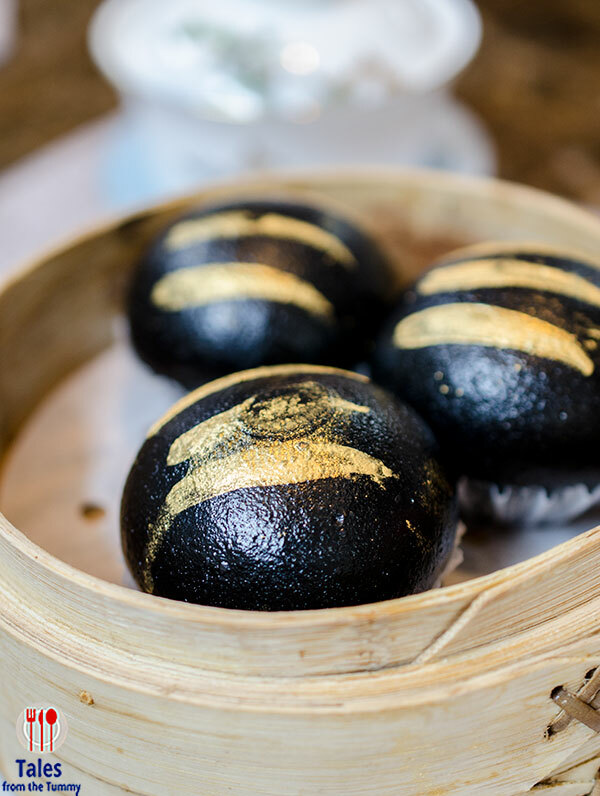 The most photographed dish at China Blue is the Black Gold Egg Custard Bun (P260). Black with gold stripes that reminded me of the pig in the anime Ranma. 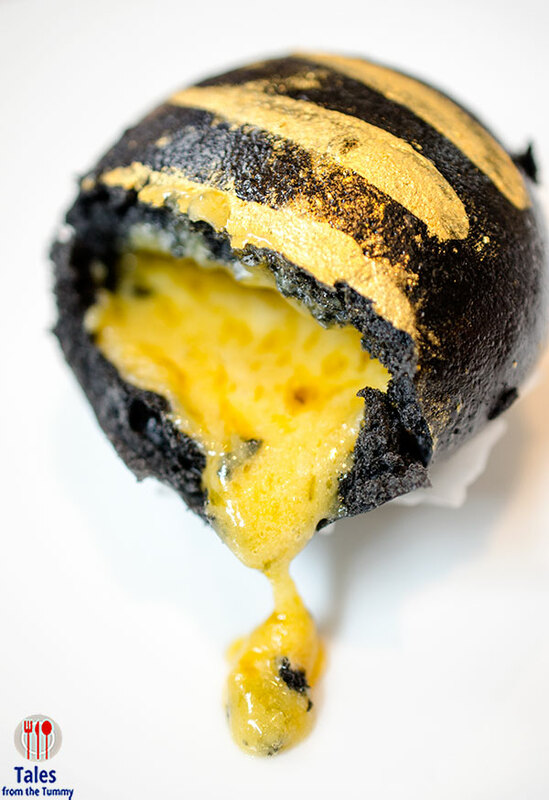 Crack open the buns and watch at the golden custard lava flows out. Careful eating this as the custard inside is very very hot. 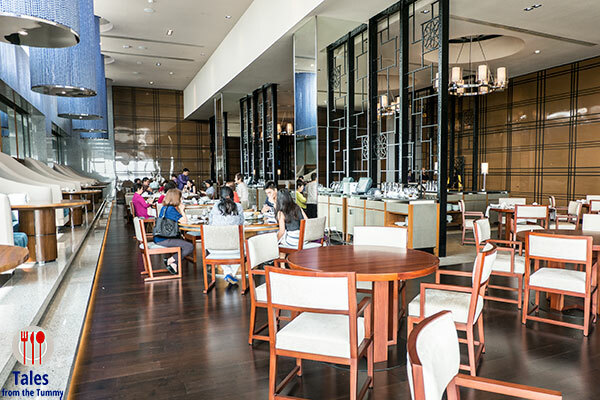 There is a lot to love at China Blue, magnificent views delight you as you take an adventure through the playful mind of Chef Jereme Leung.